Te is the perfect outcross on your N/H mares! Tootsie Roll Pine - had 469 halter points and 61 performance points and was the 1981 World Champion Aged Youth Mare. Mr Sonny Money - had 112 halter points and was the 1984 World Champion 3 year old stallion and produced such stallions as Double The Money, Temon, The Money Broker along with Design By Money. Pretty Enjoli - Design By Money's dam - had 12 halter points. Tootsie Go Te's, sire Sonny Go Te - had 15 halter points and produced halter & performance winners. Pine Delrio Hygro - Tootsie Roll Pine's sire - had 10 halter points and was a World Champion Sire. Design By Money sired the 1991 World Champion Weanling Gelding, the 1992 World Champion Weanling mare and the 1994 World Champion two year old stallion, who also was Grand Champion at the 1994 Congress. 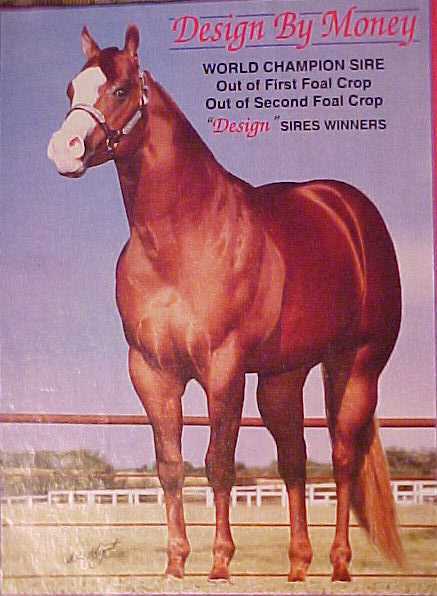 Design By Money earned 25 open halter points and was 3rd at the 1989 World Show in Open Yearling Stallions and was 5th at the 1990 World Show in Open Two Year Old Stallions. Design By Money sired 204 registered foals from six foal crops before his untimely death. Design By Money daughters seem to be doing extremely well as broodmares too. Did you know that the 2002 Reserve World Champion amateur yearling stallion & 2001 World Champion open and amateur weanling stallion, Excelled, is a son of Sunshine Design, daughter of Design By Money? Kids Gunfighter is out of a daughter of Design By Money? Timed To Touch is out of a daughter of Tesigned - 3/4 brother to Tesign? Check out our broodmares which are own daughters of well known stallions!